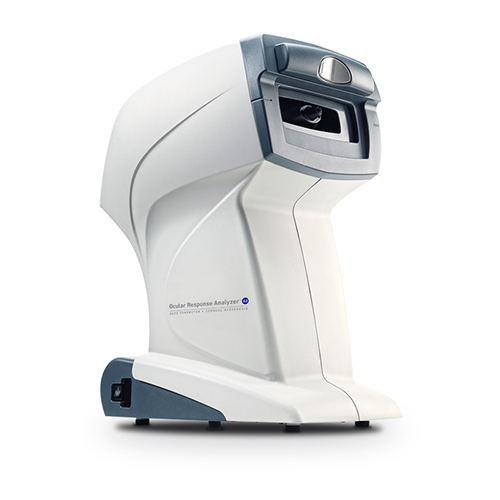 Buffalo, New York - Reichert Technologies® is excited to announce the launch of the Ocular Response Analyzer® G3, the only tonometer capable of measuring Corneal Hysteresis, a superior predictor of glaucoma progression. The Ocular Response Analyzer G3 also provides the patented Corneal Compensated IOP (IOPcc) measurement, which is a better indication of the true pressure than Goldmann or other methods of tonometry. Corneal Hysteresis is an indication of the biomechanical properties of the cornea. This information is different from thickness or topography, which are geometrical attributes of the cornea. Corneal Hysteresis is a tissue property that provides additional comprehensive information about ocular biomechanics. A low Corneal Hysteresis measurement has been shown to be a glaucoma progression risk factor. This third generation Ocular Response Analyzer from Reichert Technologies is the most user-friendly. Its fully automated alignment and unique chinrest-less design make for a fast and simple measurement that can be delegated to a trained technician. The Ocular Response Analyzer G3 is engineered to have improved measurement repeatability over previous models, and its ability to connect to electronic medical record (EMR) systems makes patient record keeping easy and worry-free. Nearly 500 articles about the Ocular Response Analyzer have appeared in peer-reviewed journals. The American Medical Association recently published CPT® code 92145 specifically for the Corneal Hysteresis measurement provided by the Reichert Ocular Response Analyzer, effective January 1, 2015. Consult a billing specialist for more information. To learn more about the Ocular Response Analyzer G3, contact Reichert at (716) 686-4500, toll-free in the U.S.A and Canada at 1-888-849-8955, or visit www.reichert.com/ora.